Nature’s bounties have connected the human spirit to its universal source and creator since the very beginning. Known to be the world’s oldest civilization, modern-day India was once a vaster region that cradled humanity’s very first cultures. The ancient science of Ayurveda, originating in the Vedas which pillared this ancient civilization, speaks about the deeper holistic science behind the exhilaration of senses when individuals come in contact with fragrances and experience its healing properties.The comfort of heart, gladdening of the spirit and rejoicing of the senses that fragrances in all their incarnations cause us to experience can be described as spiritual, healing and liberating from egoic trappings. It is the momentary experience of ‘nirvana’ or perfect wholeness and the highest spiritual state. 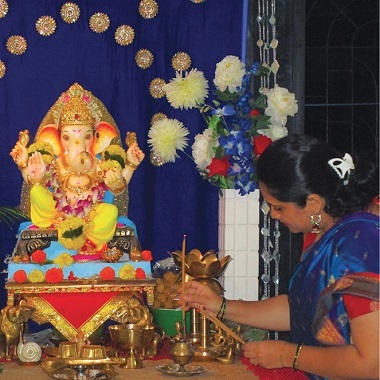 A Hindu woman offering pure sandalwood incense to the idol of Ganesha during the Ganesha festival. The significance of fragrance in worship, as a vehicle of spiritual connection has been explained in classical Indian texts. It is believed that the art of honing the magic of scent through creating perfumes and incense was first pioneered in ancient India. Mainly comprising of four comprehensive spiritual texts-the Sama Veda, Rig Veda, Atharva Veda and Yajur Veda written in classical 'Sanskrit' texts, the 'Vedas' as they are collectively called are said to be divinely revealed to early prophetic figures in Indian theological history and compiled by the legendary sage Veda Vyasa. Apart from many western scholars including prominent Germans who have extensively researched the Vedas, their wisdom even inspired the likes of legendary Mughal prince and devout Sufi Dara Shikoh to spend nearly a lifetime studying them in utmost detail! ‘Aum’ the name of the Supreme, the three-eyed one (he who can see the past, present and future), thee do we worship, the enhancer of life’s fragrance. Even later classical texts like the Bruhat Samhita of sage Varahamihira speak of several fascinating traditional perfume formulas and recipes. Navin Gundhi is among the upholders of the 200 year-old Gulab Singh Johrimal, one of India’s most ancient fragrant traditions, and an acknowledged scholar of traditional fragrance science. He explains how eight sublime natural fragrant substances are part of the Vedic ‘Ashtagandha’ (treasure house of eight fragrances) with a poetic ‘doha’ verse. Agar: oud or agarwood; tagar: turmeric-like fragrant root; chandan yugal: sandalwood pair, namely red and white sandalwood, the latter being more fragrant; kesar: saffron; kapoor: camphor; gaurochan; cow spleen; mrigmida: musk; ashtagandha bharpoor: the ashtagandha through all eight materials, becomes complete and whole. The ‘Ayurveda’ ancient Indian science of medicine is also said to speak about the holistic significance of fragrances and fragrant substances. The sages or ‘Rushis’ of old were known to have highly advanced knowledge of botany, chemistry and medical science. Their insights into the qualities and properties of each natural fragrant substance led them to develop the holistic and aesthetic science of fragrance thousands of years ago. Among the eight magical Vedic fragrant substances, sandalwood or ‘chandan’ can be called the backbone of Vedic spirituality and fragrance, as well as the key ingredient in Vedic ritual even today. Although Gundhi believes that at one time ‘agar’ or agarwood that is extracted from the forests of Assam in eastern India, must have also been offered to the sacred fire during the ‘Agnihotra Havan’ ceremony, its prices later sky-rocketed due to its high demand in the Arab market causing its scarcity and decline in usage. Agarwood has also been synonymous with its aphrodisiacal properties. Indian sandalwood (Santalum album) with its formidable 95% santalol content is considered among the world’s most superior varieties. Rigid government restrictions and regulations have however, made it difficult to easily acquire it in pure form. Sandalwood trees grow in southern India in regions like Karnataka and pure sandalwood chips and sticks are offered to the sacred fire and even in powdered form to idols of various deities throughout India. Although ‘Hinduism’ as the Vedic religion or ‘Sanaatana Dharma’ is commonly called, is said to be essentially monotheistic, idol worship and polytheism are considered later inclusions. Sandalwood incense sticks (agarbatti) and even tiny incense cones (dhoop) are offered to different deities. Sandalwood is rightly believed to be incredibly healing, calming and spiritually inspiring. Sandalwood paste is also applied on the forehead by many spiritual preachers. Making a small sandalwood ‘tilak’ mark in the center of the forehead is a common practice among Hindus and even Jains, followers of another great Indic faith, Jainism. Due to its cooling effect, many also include sandalwood in nourishing herbal facial skin packs and soaps. Camphor is also another popular and exotic fragrant ingredient that graces Vedic rituals. ‘Loban’ resin and also the gummy, resinous Indian Bedellium called ‘gugal’ play its roles in scenting Hindu worship. Among the most important forms of fragrance in Hindu or Vedic spirituality is incense. Commonly called ‘agarbatti’ or ‘light of agar,’ Navin Gundhi explains that in the olden days, only pure powdered agarwood was used to make incense sticks, hence the name. Today because of its exorbitant costs, these are a rarity, with several synthetic innovations of varied aromas filling markets. Agarbattis and dhoops are offered to deities during all rituals and religious festivals. They also fragrance Hindu households as members of the family light one or more sticks around the home, often reciting prayers and then placing them before the idols or images of the deities alongside oil lamps. Agarbatti purifies the atmosphere dispelling negative energy, enlivens the home with blissful aromas and, as many believe, symbolizes prayers rising up to God with the rising smoke. Incense forms an indispensible part of various religious ceremonies, temples and even Hindu funerals. Flowers are also the worshipper’s best friends. Apart from roses, a large variety of indigenous flowers including those from the jasmine family are offered individually, in bunches or as garlands of various sizes to idols of deities. They reflect the love and admiration of the devotee and create a perfectly spiritual atmosphere in the home or the temple. Women in many parts of India even wear smaller jasmine garlands in their hair buns. 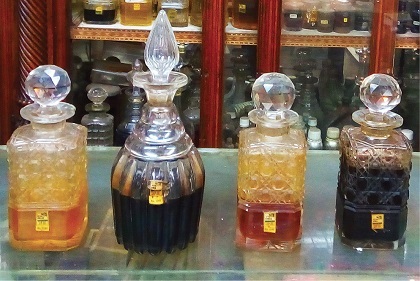 The tradition of non-alcoholic pure perfume concentrates was pioneered in India. Commonly recognized by the Arabic name ‘attar,’ these concentrates have been a part of religious ritual since time immemorial, especially in northern India. ‘Pooja’ is basically an adoration ceremony of deities, for which various essentials include fragrance. ‘Sugandh’ (cent), ‘dhoop’ (incense), ‘deep’ (oil lamps), ‘naivedhyam’ (sacred food offering), ‘pungi falam’ (betel leaf and betel nut offering) to name few, constitute the elaborate ceremony of ‘avahan’ or welcoming the deities. Traditional non-alcoholic concentrates used in Hindu worship stored in old-style Belgian-cut bottles. “Various attars are offered to different deities. During the ‘nava griha pooja’ when all nine planets are worshiped, or during the worship of different deities at one time, each is offered a different fragrance or ‘sugandhi tailam’ (fragrant liquid),” Gundhi explains. His rose and jasmine attars are widely chosen to be smeared on the clothes of the deities or on cotton buds placed at the deity’s feet and then distributed among worshippers as ‘bhog’ or sacred offering. Many offer his deep, dark and evocative ‘madan mast,’ a labdanum blend to the deity Shankar. 'Ruh gulab' or pure rose extract is a favorite of the worshipers of 'Shyam Baba', a local deity in the north western state of Rajasthan." Rose water is also a part of many auspicious ceremonies. A few other Indic faiths also are said to incorporate the practice of employing attars and incense for religious rituals. 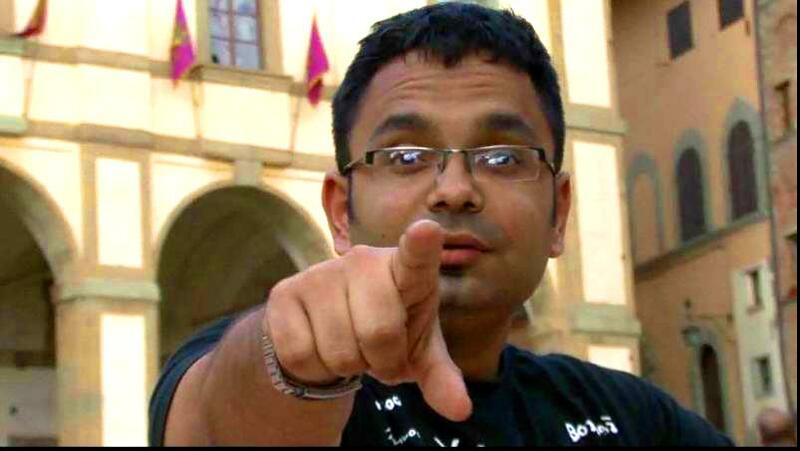 There is no worship without the charm of scent, faith and fragrance being partners in salvation for the Indian soul! Like sun and light, worship and fragrance are unspoken synonyms in the Indic spiritual thought process. Be it praying before grand sacred fires or daily household ‘pooja’ rituals, fragrance is the soul of spiritual expression, silently transporting the worshipper to the realm of divine grace.